The original super-widescreen format first public unveiling is certainly grand spectacle. A mix of travelogue, opera, sports and you are there adventures the film is the sort of event viewing that we don’t get anymore. Back in the days before cheap air fare this was the only way to see many of the wonders of the world. 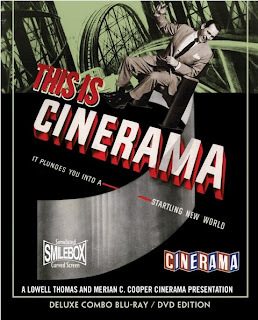 Opening with Lowell Thomas taking in small screen and black and white about the progression of sharing images, the film opened wide when announced “this is Cinerama!” From there we are off and running from a rollercoaster to ballet, to a helicopter ride over Niagara Falls to Aida at La Scalia to speedboats and water skiers in Florida, to a meeting of the clans in Scotland and finally a fly over across America. Designed to give the audience an Oh Wow factor off the charts the film is certainly spectacular. It’s a you are there and in your face trip around the world that is so real you’d swear you were everywhere they were showing. It’s so cool as spectacle I really wish I had the chance to see it that big. And that’s the rub, even seeing the film on the biggest TV today you’re not seeing the film as it was designed to be seen. What you’re seeing is a super wide screen film that looks a bit odd on TV. It doesn’t move and react as a typical film- it moves and reacts as a POV film does.- which makes watching it on TV a strange experience. Also making it an odd experience is the lack of a story or through line. It’s simply a series of events. As a movie on its own terms- and not as pure spectacle it’s okay. Yes things some things are cool, the rollercoaster , Niagara Falls, being in La Scalia some of the water skiing. But largely the film just sort of is. As a movie movie its actually kind of bland with the water skiing and flight over America that take up most of the last hour (the flight is about half an hour) going on way too long. Yes they were never meant to be seen on TV or seen small, which makes picking on them kind of unfair- Sadly however I have to warn you because that’s how most people are going to see the films. Hats off to Flicker Alley for taking the time and trouble for restoring this and the other Cinerama films but unless you are a film geek who is interested in the stories about the making of this film and the Cinerama process, you may want to pass on buying the DVD/Bluray release because you’ll only watch the film once (The other films you may watch more). For me the movie nut seeing the film, and all of the extras, is great fun. I like to see what and hear what it took not only to make the film but also to clean it up and make it presentable today.